SMRTram was my indoctrination to the problem of trying to build a collective good that, in itself, generates no revenues to pay for its costs, but which could potentially benefit a local community in substantial ways. The ten year odyssey began shortly after my wife and I moved to Annapolis, Maryland and opened our architectural practice on Main Street. By accident I stumbled upon what seemed a startling piece of information: Research showed that the average distance a pedestrian would walk after they parked their car in an urban setting was only 1000 feet. Just under a quarter of a mile. I began giving consideration to the many implications this “Pedestrian Access Distance” had for the kinds of urban habitats I’d been theorizing about, off and on, since I’d been in architecture school. Out of curiosity, I began a “project” to see if a 1000 foot Pedestrian Access Distance was, in fact, impacting the Main Street shopping district where we had opened our small office. (We didn’t have a lot of work in those early years, so I had a bit of “spare” time.) What I did was count parking spaces, map them on a plan of the downtown business district, and overlay them with 1000 ft. radius circles. Next, I made an assumption about how often and how long each parking space was occupied, and how many pedestrians (customers) were produced each time somebody parked. Then I added up all the pedestrians (customers) produced in each circle—and where the circles overlapped, I added those numbers together. This produced a map of “zones” each of which had a different number of “pedestrians/hour” predicted to be produced by the parking spaces within 1000 feet of that zone. 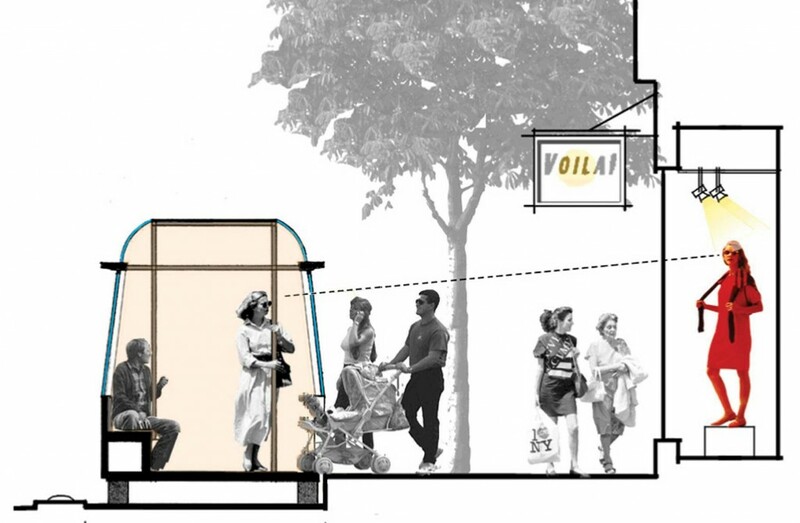 If you could devise a way to significantly “stretch” pedestrian access distance, you could radically modify—and increase—the customer base for an urban business district. 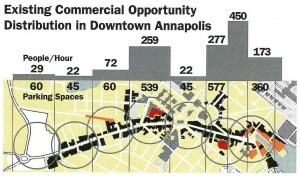 In fact, I realized, you could do a good deal more than that: You could reduce the traffic congestion (which in Annapolis was often gridlocked on weekends) by providing easy to access parking facilities on the edge of downtown rather than in the middle of it. This would (a) eliminate people driving around and around in traffic choked streets looking for a curbside parking space; (b) make it easier for visitors and shoppers to find and access a parking space; and (c) dramatically increase the total number of parking spaces providing customers for the entire downtown business district. The question, of course, was how do you “stretch” pedestrian access distance? How do you change the perceptual and behavioral habits of people? How do you get them, after they park their car, to be willing to “walk” a mile or more to get to their destination without even thinking twice about it? The analogy I could see was the elevator. 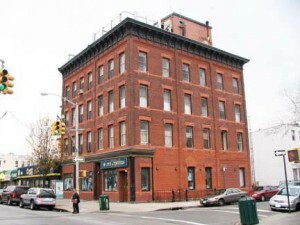 Before Elisha Otis invented the modern elevator (risking his life to demonstrate a fail-safe braking system in the event of a cable break), buildings were only three (or maybe four) stories tall at the most. Obviously, there was a vertical “pedestrian access distance” at play: three sets of stairs and landings were all the average person was willing to negotiate. This notion became the inspiration for SMRTram (Single-lane, Multiple-vehicle, Reversible, tram system). The challenge was to create a people-mover that “fit” into a typical urban business street context while providing the same four convenience features that make elevators work with such efficiency. Only a minute or two wait for the elevator to come. People remain “pedestrian-oriented” (standing) after they board. 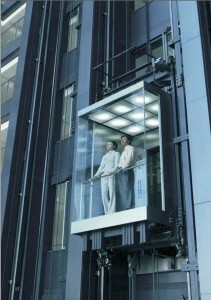 People can get off and back on at any “floor” along the elevator route. At each “elevator stop” they can choose to go in either direction along the route. SMRTram accomplishes these four goals by transforming the parallel parking spaces on one side of a downtown street into a single, dedicated tram-lane—and then operating multiple tramcars in each direction along this single lane at the same time. This is made possible by a synchronization system ensuring that oppositely moving tramcars (a) only meet—head-on—at a tramstop, and (b) opposing tramcars always arrive at a mutual tramstop at the same moment. A short by-pass at each stop enables the oppositely moving trams to bypass each other (after people have gotten off and on) and continue moving in their opposite directions along the single, dedicated lane. Because of the synchronous arrivals, users never have the sense of having to wait for the opposite tram in order to proceed in the direction they want to go. This synchronization enables the SMRTram system to operate with high capacity and short “headway” (the time a pedestrian has to wait for the next tramcar to arrive). At full capacity, the number of tramcars operating simultaneously in the system is equal to one less than the total number of tram-stops. 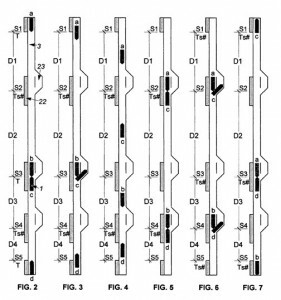 (A system with nine stops, for example, can operate eight tramcars at full capacity.) This generates a headway of two minutes: Every two minutes, pedestrians can board a tramcar, going in either direction, at each tram-stop. Up to 5000 people/hour can be moved, in each direction, from one end of the system to the other. As they travel along the street, adjacent to the sidewalk, tram-riders can make eye-contact with pedestrians and storefronts along the way. No storefront is more than 1000 feet from a tram-stop. The SMRTram system, then, is different from a bus in the sense that it isn’t intended to carry people from point A to point B, but connects them to any point between points A and B. The SMRTram movement then, encourages exploration and shopping along a specific corridor—and provides potential customers for any business within 1000 feet of the tram route. The trams have many fail-safe features (which can be greatly enhanced with the driver-less technologies currently being developed). They do not travel fast, but they move consistently, independent of street traffic congestion. 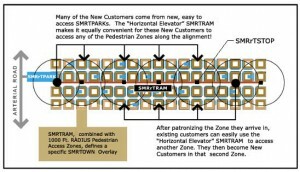 I received two patents for the SMRTram synchronization logic and commenced an all-out effort to market the idea of transforming urban business districts into “horizontal skyscrapers”! There was a lot of interest in various North American cities, but in the end, the final question was always the same: “How could we possibly pay for it?” This ubiquitous inquiry arose primarily from the fact that, by the nature of its operations, SMRTram had to be free to ride. The essential concept for it depended on a convenience level so high that pedestrians would actually use it, without the merest consideration, to extend their access distance. The act of having to pay a fare to get on not only slowed the synchronization convenience, it changed the psychological “frame” of the experience. How many tall buildings would be functional if people had to pay a fare each time they used the elevator? Eventually I gave up trying to imagine ways to “embed” the cost of SMRTram in other things (there were many ways to accomplish that―parking fees, sales tax, etc.) and gave up as well trying to convince city officials and finance directors that the payoff would be a major increase in business vitality and downtown livability. Also, of course, no one had ever built and operated a SMRTram system before. I learned that cities, understandably, are not experimenters. Obviously, the federal government was the one to determine if SMRTram was operationally viable and would have the beneficial impacts I’d envisioned. But the federal government seemed barely able to appropriate enough funding to keep city buses on the streets, or repair failing bridges, or fund new city water systems. Most political leaders and economic advisors, it seemed, believed that if a service couldn’t be profitably provided by private enterprise, it probably didn’t deserve to exist. A “horizontal elevator” that was free to ride simply wasn’t going jump out as a target on the federal radar screen. Eventually I moved on to smaller things—ideas I could experiment with using my own capital: HOUSEED core modules (my old college thesis concept). I also began, vaguely, to reflect upon and ponder the question of why collective society was so ineffective when it came to building basic things everyone would benefit from—why we seemed so completely dependent upon what the “market economy” decided was “profitable.”….